Marauder Gun Runners offers painted Series 6 gear! DISCLAIMER: There will be little-to-no objectivity shown in this post. If you’re looking for objective journalism, try a real news site! We love Marauder Gun-Runners here at JBL! Just when you thought Marauder Gun Runners couldn’t make their products any better, something like this occurs! MGR is now offering a factory-painted set of their incredible Series 6 weapons! That’s right– you can deck out your favorite 1:18 action figures with gear that has been molded in gun-metal gray and then painted with either desert or forest colors. 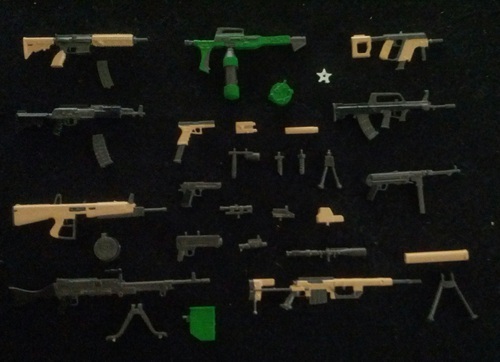 It’s an amazing set of 33 painted weapons and accessories for only $24.99! Didn’t like the rifle that came with the FSS Barrel Roll? Easy– swap it out with the painted M200! Need to jazz up the FSS Grunt figure? Toss in the AA20 automatic shotgun! Want to clear out a nest of Zombie Vipers? Give Outback that painted combat flamethrower and light ’em up! You can place your order for this incredible set HERE!